Intro: Indianapolis suffered a second wide-margin defeat in four games by losing at Arizona, 40-11. The Colts are at 7-4 and still own a two-game lead in the AFC South in hosting 5-6 Tennessee, their closest divisional foe. INDIANAPOLIS – The Colts’ trip to Arizona more resembled the one they took to San Diego in week six (19-9 loss) than it did the one to San Francisco in week three (27-7 win). The Colts (7-4) fell at Arizona, 40-11, in a game they never led and one that spun out of control in the first 30 minutes. Indianapolis has responded from eight prior defeats under Chuck Pagano with victories, a resilience that must be called upon again as Tennessee (5-6) visits with intentions of tightening the AFC South race and earning a playoff berth of some kind. Improvement is needed from the Colts, and here are FIVE THINGS LEARNED. PERCEPTION VERSUS REALITY – The reality is Indianapolis needs to play more consistently in the next five games than it has done in the last four. Personnel losses have not been used as a crutch, and the secondary has been battered of late after most of the injuries early in the year were spread across the offense. While players said they could not “big-picture” the situation in the moments after the Arizona game, a long flight home certainly provided that time. Sure, 8-3 beats 7-4. Sure, New England had pulled it off (going to 8-3 from a near 7-4 after a 24-point home halftime deficit to Denver) about the same time the Colts’ flight landed. What’s done is done, but reality also holds that the Colts control their playoff fate with a two-game lead over Tennessee. This Sunday’s game has added implications, but no added meaning. Chuck Pagano says every game is a must-win because he wants to win them all. The approach this week will be to improve and take advantage of being in a good spot. No season-opening goal has been lost. STILL SEARCHING POST-REGGIE – The 16 quarters Indianapolis has played since Reggie Wayne’s injury late in the Denver win have seen the team struggle much more than thrive. T.Y. Hilton has done well. Colts tight ends did well at Tennessee, but large deficits have put the offense in modes it doesn’t particularly enjoy. Needing a surge at Arizona, wide receivers other than Hilton caught six-of-13 passes targeted, gaining 57 yards. After tight ends had nine receptions in 13 attempts against Tennessee, the unit had five receptions at Arizona. The offense is laboring with a consistent identity. Early deficits have hindered the growth. MAKE A PLAY – When Arizona moved for a game-opening score, the onus shifted to a team whose first-half struggles have been rehashed and debated for the past month. Still, Indianapolis failed to extend five-of-six first-half possessions beyond three plays. The one drive that did stalled in the red zone. The offense also gave up a defensive touchdown to Arizona in that span as the Cardinals bolted to a 24-point halftime advantage. The Colts now have converted three-of-25 first-half third downs in the last four games. Until it improves, this remains one of the key storylines around the team. STOP A PLAY – Over the last four games, opposing quarterbacks are operating at a 122.1 rating level and though it’s a small sample compared to 11 games, only one QB in the league has higher individual seasonal rating. Since beating Denver, the success of opposing QBs (Case Keenum, Kellen Clemens, Ryan Fitzpatrick, Carson Palmer) has caused the Colts’ seasonal numbers to increase in pass defense – 58.7 completion percentage to 61.3; yards per attempt from 7.23 to 8.07; yards per completion from 12.3 to 13.2; TD:Int ratio from 8:8 to 16:8 and rating from 78.3 to 92.4. The Colts have allowed 11 TD passes while intercepting one. CIRCLE TIGHTLY – A cut-throat, competitive league can have teams going from advantageous positions to peril in a matter of two-to-four weeks. Clearly the Colts are more in peril than after being 6-2. To a man, players are circling tighter to improve themselves and to lessen any noise outside the locker room that could cause harm. While this could sound minimally important outside the circle, those inside it know the imperative nature of doing so. Antoine Bethea said Sunday the Colts win and lose as a whole, and they must look each other in the eyes to spur a rebound. Hanging as a band of brothers is the only way. With Monday Night Football on the schedule this week, the Colts will ramp up their practice pace on Thursday afternoon. Today’s news looks at the early talk of Peyton Manning returning to Indianapolis and the play of Jerrell Freeman. Take a look below at the top pieces from Thursday, October 10th. At NFL owners meetings in Washington D.C., Bell caught up with Colts owner Jim Irsay to take a look ahead at the October 20th meeting with the Denver Broncos. Obviously, Peyton Manning was the topic and the Colts plans for welcoming back No. 18. The calendar has turned to 2013 but Jerrell Freeman is once again turning heads, especially after his game-high 13-tackle performance against Seattle. Freeman, according to the Colts (who keep their own tackle statistics), had a team-record 203 tackles last season. Not the kind of thing you generally expect from a guy who played college ball at a former women’s school and began his career with three years in obscurity north of the border. But that’s in the past. Freeman didn’t get here by being easily satisfied. In the first of many national stories comparing Luck and Manning over the next week and a half, Wetzel looks at the questions surrounding the former Stanford signal caller when he was drafted by the Colts. There were just a few things no one could measure. Could Luck handle the pressure of replacing a legend? And if, yes, what if that legend returned to greatness with another team, offering a weekly reminder to players and fans back in Indianapolis of what they were missing, what they had let go? What no one could imagine was the possibility that Manning might not only return to form, but actually be better than ever – as he’s been this season in Denver. Or, to take even further, to play the position better than anyone has ever played it. What kind of a young player could handle that? As it turns out, Andrew Luck. The practice week for the Colts will wrap up this morning. Today’s news looks at the Colts balanced attack, comparing Russell Wilson to Andrew Luck and Trent Richardson’s patience. Take a look below at the top pieces from Friday, October 4th. Since Peyton Manning arrived in Indianapolis, the Colts were almost always known for their prolific offense. Comparing the 2012 quarterback draft class will be an endless endeavor over the next decade. While Russell Wilson has dual-threat capabilities, he made it clear what his “label” is as a quarterback. Isn’t that Luck in a nutshell? 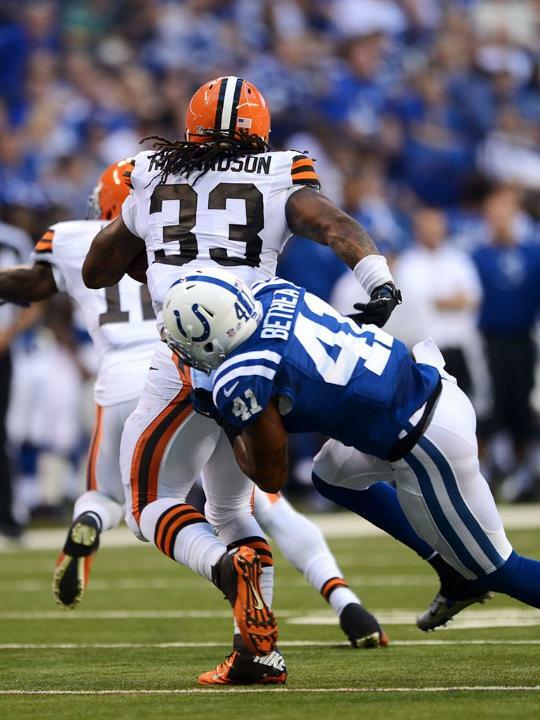 Trent Richardson isn’t worried about his quiet start with the Indianapolis Colts. Richardson has rushed for 95 yards on 33 carries in two games since the Colts acquired him from Cleveland on Sept. 18. His longest run has been 12 yards as he searches for a crease to break free. Antoine Bethea joined the NFL AM crew last week and the eight-year veteran shared some insight on a couple of interesting storylines with the Colts. 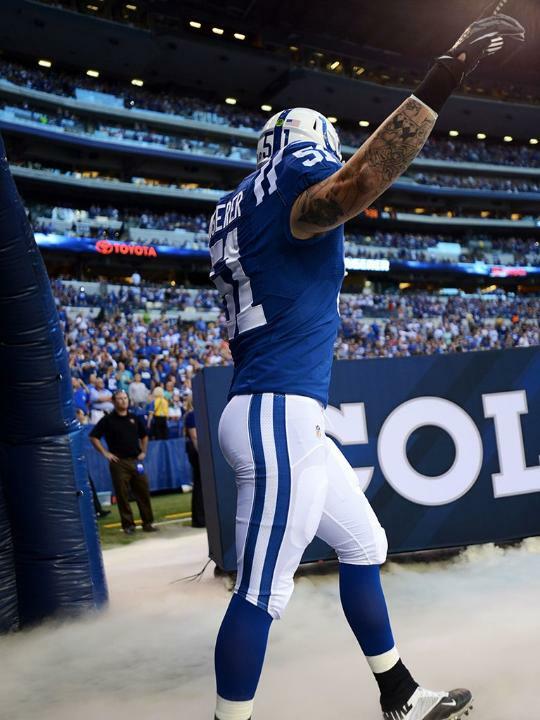 Since being drafted in 2006, Bethea has seen an immense amount of turnover over the years all over the Colts roster. While the faces around Bethea have changed significantly, the safety has enjoyed watching new teammates fit into the Horseshoe. “It’s different having different guys come in and out but it’s a lot of fun seeing a lot of the young guys come in, step in and make a lot of plays for us, especially coming off last year. It’s been a great ride,” Bethea said. One of the new teammates who has joined Bethea in the secondary is LaRon Landry. The Pro Bowl safety is known for his physicality and Bethea is ready to welcome receivers to the Colts secondary this year. Typical to most national interviews, the segment was not over until Bethea fielded a question about Andrew Luck. Bethea said one of the things that Luck has improved on this year is accepting the fact that he doesn’t need to force balls into tight windows. “This year in preseason (Luck) will get a check down to a running back. He will put the ball in places only where receivers will catch the ball,” Bethea said. Two statistics that every NFL defensive coordinator looks at when scouring a post game box score are third-down efficiency and red zone efficiency. Greg Manusky has to be very pleased with what his eyes are seeing after looking over the Colts/Giants box score. 12:17 to go in 1st quarter-With the Giants facing a fourth-and-one, Andre Brown is stuffed on a run to the left by Erik Walden and Antoine Bethea. 6:44 to go in 1st quarter-The Giants settle for a 25-yard field goal after reaching the seven-yard line before an Eli Manning incompletion. 4:09 to go in 2nd quarter-The Giants drive down to the Colts five-yard line but lose four yards on a David Wilson carry before eventually kicking a 27-yard field goal. :03 to go in 2nd quarter-The Colts force a pair of incompletions from the Giants 12-yard line. New York kicks a 45-yard field goal after an unsportsmanlike conduct penalty. Greg Toler’s interception came on a third-and-one late in the first quarter. Then in the second half with the Colts not allowing the Giants into the red zone, Caesar Rayford and Marshay Green both recorded sacks on third downs. From a first-half yardage standpoint, there wasn’t much of a differential (15 yards) between the Colts and Giants. It was all about defending the goal line that made up the eight-point difference.